When it comes to nabbing yourself a truly workable work wardrobe – you need to curate a collection that is practical as well as punchy! Think quirky details, popping colours and classic shapes in brilliant “wash and wear” fabrics. If you aren’t sure where to start, simonjersey.com is a great jump off point for great pieces that will wear beautifully and stylishly. A classic shift dress will never go out of style and the flattering slash neck and cap sleeves on this bad boy keep it looking fresh. It’s available in classic black, as well as navy, grey and plum – so why not get the whole cavalcade of colour for your working week? It also can be dressed up in lots of different ways – which means it can take you from the boardroom to the bar with a few tweaks. Think bold, chunky statement necklaces and fierce, colour pop heels and a great trophy jacket – add large latte or Espresso Martini as applicable! Monochrome – always on trend and always so easy to wear. Especially in this comfortable shape and material. Teamed tucked into uber cool culottes with some brogues or paired with a floaty pleated skirt with a bright and dainty cardi thrown over the shoulders, this top will fast become a work go to when you want to feel smart but relaxed. Simon Jersey does this little number in a number of colour ways and prints – so if you love it, you may want to nab a number of these to slot into your wardrobe stat! Ooh la la – there is just something so chic about this little number! This wrap tunic can be a knockout throughout your work year: during those tricky sticky summer days, pop this over a lace cami, clinching in at the waist with either the tie belt it comes with or popping a luxe leather one on. Add chic, floaty palazzo pants, layered gold necklaces and espadrilles and you are god to go. When the chill of winter nips, swap the camisole for a thin knitted polo neck, the floaty trews for slim legged cigarette pants and tuck on those sassy ankle boots. 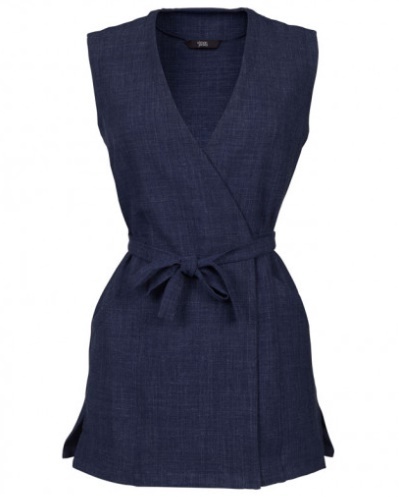 This comes in black as well as this super chic navy – so it would be rude not to have both right? Right! Oh – and did I mention it has pockets? Who doesn’t love a surprise bit of pocket action? All hail the tie waist! Blessing you with all the waist flattering-ness, this lightweight dream of a top, which has a cheeky bit of stretch too, is going to fast become your work bff. The tie can be done at the front, as pictured, or done up at the back – giving you a multitude of looks. I’m really feeling this nod to the kimono trend in chic grey, which looks spot on with matching or toning grey trousers or would look equally good with something popping, like red or cobalt blue trews. Again, Simon Jersey has blessed us with a whole heap of colour ways, so there really is something for everyone. Designed exclusively for Simon Jersey, print lovers rejoice! Comfortable yet looking super smart, this is the holy grail of workwear and a godsend for summer. 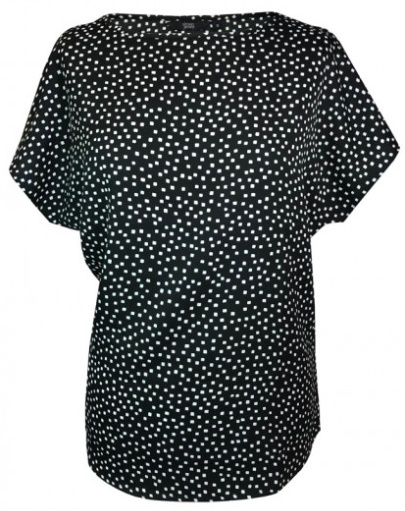 In cool crepe, you don’t have to worry about unslightly creases whilst the pattern does the talking. 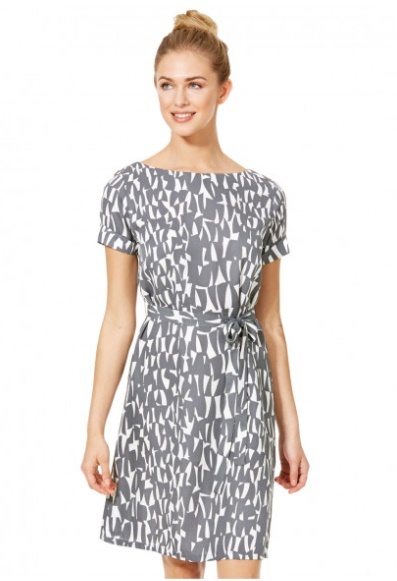 This is the perfect dress for those big meetings where you want to make an impact! Again cinch at the waist with the tie belt or with one of your own faves, pop over a chunky long length cardi or floaty waterfall coat and pair with wedges for summer and tights and ankle boots for winter. Nailed it! So prepare to turn heads as soon as you step through the door, by catching the boss’ attention in all the right of ways! By projecting confidence and style, you’ll not only be promoted in the workwear style stakes, but also in the work place. And remember, it’s the person wearing the clothes that might just change the world. After more fashion inspo – for work or play? Check out all our fashion posts here! P.S. Want more FDJ LDN-ness in your life? It’s time to get yourself on our mailing list then! Just click the “Subscribe” button at the top right of the page and you’ll get our posts as soon as they go live! You can also follow us on Bloglovin’ if you like. And be sure to check us out on social media! Follow us on Twitter, Instagram and Facebook. *This post is in collaboration with Simon Jersey – – all styling, choices and opinions are our own as always though fillies.